Buckingham Opticians provide a dedicated and highly experienced advice, fitting and aftercare service. Dr Buckingham holds a higher diploma in contact lens practice (DCLP) as well as having been awarded life-time membership of the British Contact Lens Association (BCLA) for his contribution to contact lens practice and research. His experience fitting contact lenses stretches over 30 years using a range of designs and materials. It essential that contact lens wearers have correctly fitted contact lenses to maintain the health of their eyes. At Buckingham Opticians we provide a dedicated and highly experienced advice, fitting and aftercare service for our contact lens patients. There are a range of contact lens designs to suit your individual needs and Dr Buckingham will be able to advise you on which would suit you during an initial consultation. 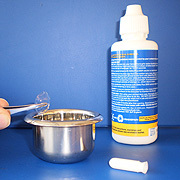 We also stock a range of contact lens cleaning and soaking solutions and cases. Hard contact lenses are designed for repeated use - they are removed each night, stored in a soaking solution, and cleaned before wearing them the next morning. Although they are made of a rigid plastic material, they are gas permeable and so allow oxygen to reach the surface of the eye, maintaining eye health. At Buckingham Opticians we prescribe and fit hard contact lenses made by leading manufacturers including Cantor & Nissel and Bausch & Lomb. 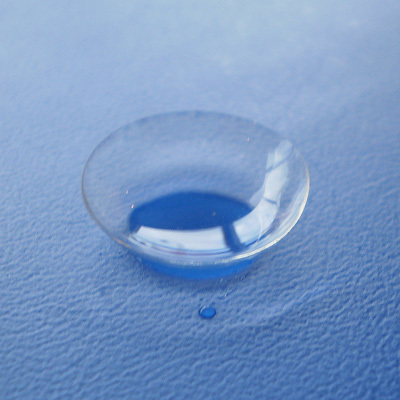 Soft contact lenses are made from a soft silicone-based plastic material which also allows oxygen to the surface of the eye. There are a number of different designs and materials available for patients to trial. Some are reusable, like hard contact lenses while others are designed to be disposable after a short period of wear (daily or monthly). We prescribe soft lenses manufactured by leading companies including CIBA Vision, Johnson & Johnson, Sauflon, Bausch and Lomb and CooperVision. Varifocal contact lenses are suitable for mature contact lens wearers who normally wear reading glasses over their contact lenses. Like varifocal glasses they provide both distance and reading vision. We recommend 6 monthly aftercare consultations to check your eyes and to ensure your contact lenses are still functioning well. You can of course always contact the practice to book an appointment, for advice or to allow us to order new lenses for you.